Kellner’s troop commander inventoried his personal effects, disposed of them through a council of administration probably by selling them to soldiers in the troop, and sent the monies along with retained pay and pay for clothing not drawn–in all about thirty-eight dollars–to the Adjutant General’s Office in Washington. The soldier’s mother, Frau Heline Kellner, almost certainly received her son’s monies at her home in Germany where she filed for a pension on 21 March 1891. August Keller came to America aboard the Hamburg-America Line steamship Gellert. August Kellner was born about 1861 in the small village of Klein Schönwalde on the Baltic Sea, which at that time was in the district of Stralsund in the Prussian province of Pomerania, what today is known as Groß-Schönwalde, Ostvorpommern, Mecklenburg-Vorpommern, Germany. All that is recorded of his family is that his mother’s name was Heline. By the early 1880s Kellner was working as a fleischer or butcher in the city of Schwerin about 175 kilometers west of his birthplace. Kellner left his homeland in May 1883 when he made his way to Hamburg, boarded the steamship Gellert, and traveled up the Elbe River into the North Sea and across the Atlantic arriving in New York Harbor on 12 June. Kellner enlisted in the Army at Fort Snelling, Minnesota, on 8 July 1885, again listing his occupation as a butcher. The twenty-four-year-old German emigrant stood just under five feet, five inches with grey eyes, light hair, and a fair complexion. He was assigned to H Troop, 7th Cavalry under the command of Captain Charles C. DeRudio where he served in the Dakota Territory at Forts Yates and Meade. Kellner completed his five-year enlistment on 7 July 1890 at Fort Sill, Indian Territory. He traveled to Germany and likely visited his mother before returning to America in August. On 19 September Kellner made his way to Fort Leavenworth where he enlisted again this time in E Troop, 7th Cavalry. Little more than two months later he arrived with his troop at the Pine Ridge Agency on that winter’s fateful campaign in which he lost his life. Following his death at Wounded Knee, August Kellner was buried along with twenty-nine of his comrades in a makeshift cemetery next to the Episcopal church at the Pine Ridge Agency. He was recorded as being interred in grave number 14. 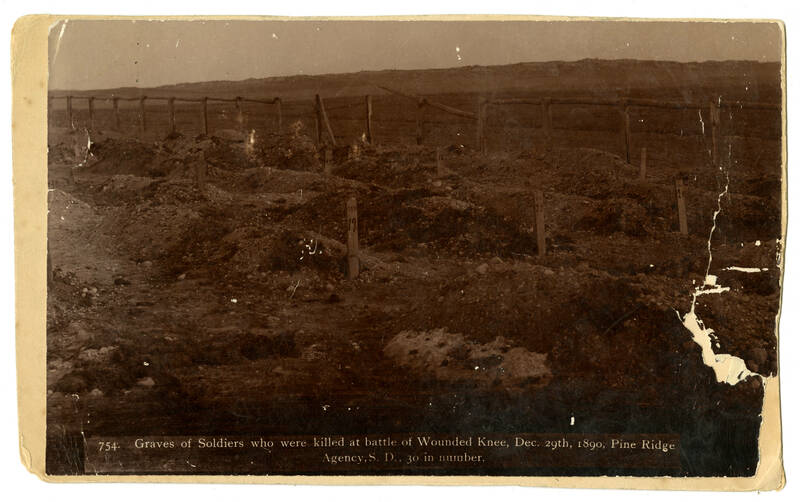 William Richardson Cross’s photograph of the soldiers’ graves at Pine Ridge in January 1891. The graves were initially marked with numbered boards. 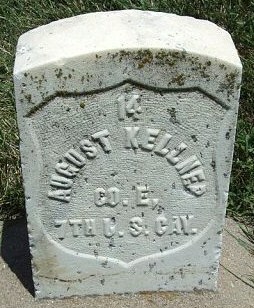 Kellner’s grave number 14 is pictured on the back left. More than fifteen years later his and his fellow fallen troopers’ remains were exhumed from South Dakota and returned to Fort Riley, Kansas, where they were reburied in the post cemetery. Private August Kellner is buried in the Fort Riley Post Cemetery. Omaha Daily Bee, January 1, 1891, 1; Adjutant General’s Office, Medal of Honor file for Mosheim Feaster and Thomas Sullivan, Principal Record Division, file 3466, Record Group: 94, Stack area: 8W3, Row: 7, Compartment 30, Shelf: 2. Research conducted by Vonnie S. Zullo of The Horse Soldier Research Service. National Archives, Adjutant General’s Office,Final Statements, 1862-1899, “Kellner, August,” at Fold3, http://www.fold3.com/image/271303471/ accessed 8 Nov 2014; National Archives and Records Administration, U.S., Civil War Pension Index: General Index to Pension Files, 1861-1934 [database on-line], Provo, UT, USA: Ancestry.com Operations Inc, 2000. Norway-Heritage Hands Across the Sea (http://www.norwayheritage.com/p_ship.asp?sh=gelle) accessed 8 Nov 2014. Ancestry.com, U.S. Army, Register of Enlistments, 1798-1914 [database on-line], Provo, UT, USA: Ancestry.com Operations Inc, 2007, 1885-1890, image 578, line 218 and image 626, line 212; Staatsarchiv Hamburg, Hamburg, Deutschland, Hamburger Passagierlisten, Volume: 373-7 I, VIII B 1 Band 084, Page: 0, Microfilm No. : S_13159. ; New York, Passenger Lists, 1820-1957, Year: 1890; Arrival: New York, New York; Microfilm Serial: M237, 1820-1897, Microfilm Roll: Roll 553, Line: 49, List Number: 1188. Adjutant General’s Officer, “7th Cavalry, Troop E, Jan. 1885 – Dec. 1897,” Muster Rolls of Regular Army Organizations, 1784 – Oct. 31, 1912, Record Group 94, (Washington: National Archives Record Administration). William R. Cross, photo., “Graves of Soldiers who were killed at battle of Wounded Knee, Dec. 29th, 1890, Pine Ridge Agency, S. D., 30 in number,” . Jana Mitchell, photo., “August Kellner,” FindAGrave (http://www.findagrave.com/cgi-bin/fg.cgi?page=gr&GRid=59151344) accessed 8 Nov 2014. 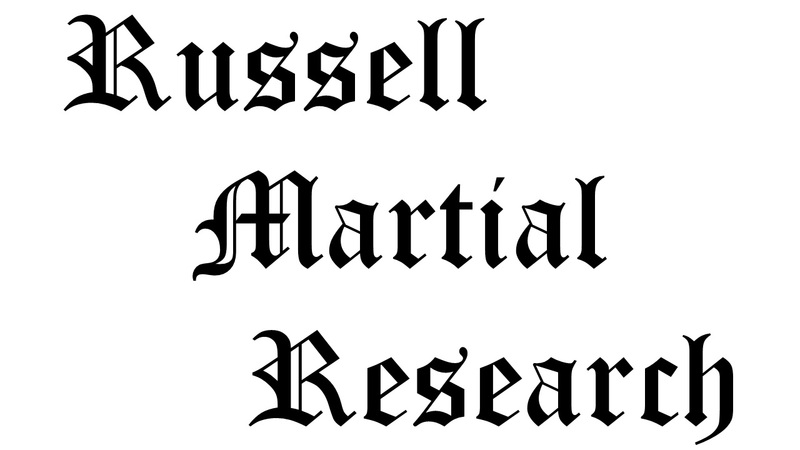 Citation for this article: Samuel L. Russell, “Prussian Butcher Private August Kellner, E Troop, 7th Cavalry – Killed in Action,” Army at Wounded Knee (Sumter, SC: Russell Martial Research, 2013-2015, http://wp.me/p3NoJy-Aj), updated 15 Dec 2014, accessed date __________. This entry was posted in Casualties, Enlisted and tagged 7th Cavalry, 7th Cavalry Regiment (United States), Battle of Wounded Knee, Big Foot, Killed in Action, Medal of Honor, Pine Ridge, Pine Ridge Agency, Pine Ridge Indian Reservation, Sioux, Wounded Knee, Wounded Knee Creek, Wounded Knee Massacre. Bookmark the permalink. I can’t seem to get my suggestions re the latest blog to you. But please scratch all the “likely” in the first two paragraph and substitute, probably, most likely and could have . I greatly appreciate your taking the time to read and comment on my postings, and am thankful for your input as I crank out these short essays. I do intend to cobble all of this together as a book one day, but am content to churn it out as a blog until such time as I believe I have completed my research. I thoroughly enjoy the research, but the writing I find a bit tedious. After more than a decade, I had amassed piles of research material but had yet to begin writing. I began my blog last year as a forcing function to write. I recently downloaded a Kindle version of your book, Pocahontas, and have enjoyed it immensely. interesting story! I just wanted to drop you a line on two things I noticed which are probably not quite right. Greifswald is located at the Baltic Sea (I go there for summer vacation each year with my family). The Black sea is a different matter. My grandfather from Hamburg was stationed there on the Crimean Peninsula with the Kriegsmarine (the city of Inkarman of Charge of the Light Brigade fame), and that’s at least 2,000 miles away from the Baltic Sea. The name Heline also doesn’t sound right. I doubt that name exists at all. It would rather be Helene. a rather common name. Great page and best regards! Sven… Thank you for taking the time to comment, and for pointing out my glaring error. I’ll blame it on my typing rather than my knowledge of European geography. Anyway, I have corrected the post, and have you to thank for the correction. I enjoy your posts and comments on OIW.